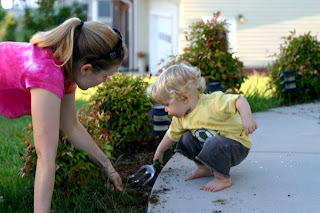 As I was gardening the other day (or more like pulling weeds from the flower bed), Finn thought I looked like I could use some help. He picked up the weeding tool and got right to business. He stuck to task for quite a while too. He's going to be a great gardener!